Yes, I know Spring is a few long months away but it is nice to think about it - especially after a long stretch of photos that are primarily white, gray and icy blue. 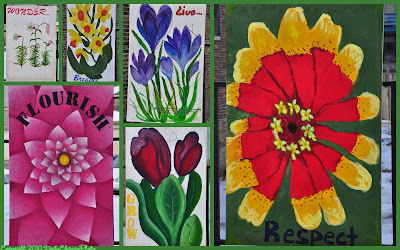 These beautiful murals line a stretch of Commercial Avenue in the South Chicago Neighborhood. According to notes on one of the murals, they were created by students of the South Chicago Art Center. The SCAC blog states that "The hope is that the paintings improve the aesthetics of the neighborhood." I think they accomplish that goal and also provide a nice pop of color on these monochromatic winter days. They are beautiful and I'm sure the color is most welcome! We are having a warm spell this week and today it might get up to 70 degrees. Those are very bright and colourful!